Holman: Ash Roses | Lawrence Wiliford | Dispeker Artists, Inc. This is the first recording entirely dedicated to the songs of celebrated Canadian composer Derek Holman. 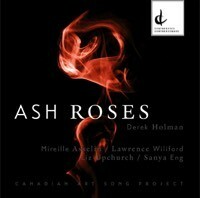 Ash Roses highlights a group of Holman’s works written over a twenty-year span that coincides with the composer’s most prolific period of writing art song. The program features a group of artists well known for their dedication to song and chamber repertoire. Tenor Lawrence Wiliford, soprano Mireille Asselin, pianist Liz Upchurch and harpist Sanya Eng perform all previously unrecorded works that include Ash Roses (1994), Now Sleeps the Crimson Petal (2007), The Four Seasons (2009) and a collection of songs for high voice and harp (2011).